Play, perform, produce. The new Akai Force blurs the lines between production and performance. 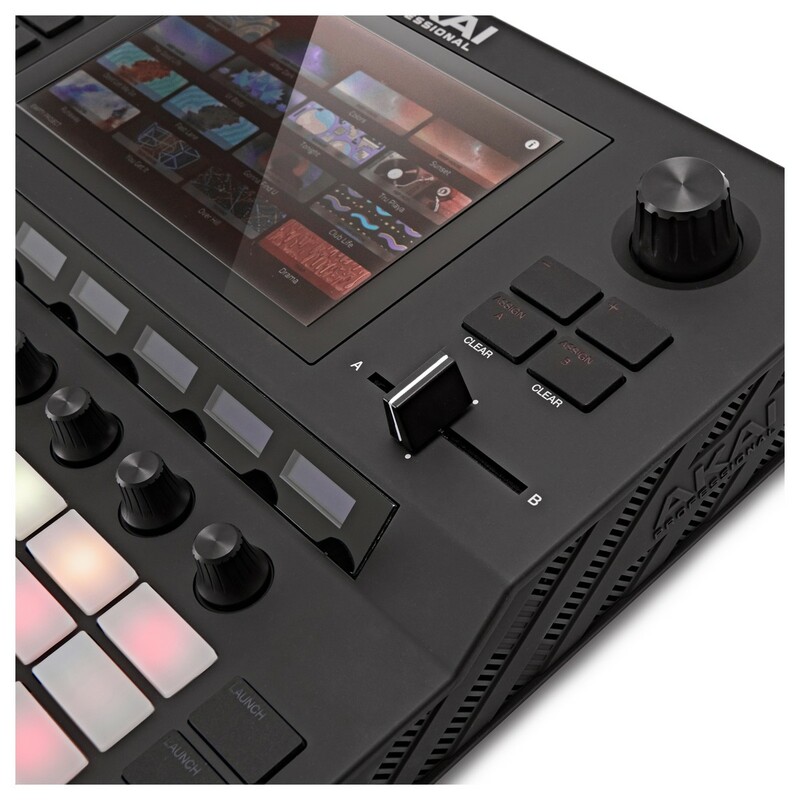 Designed with DJ and sample-based performance in mind, the Akai Force combines all the essential elements needed and puts them into one compact box. 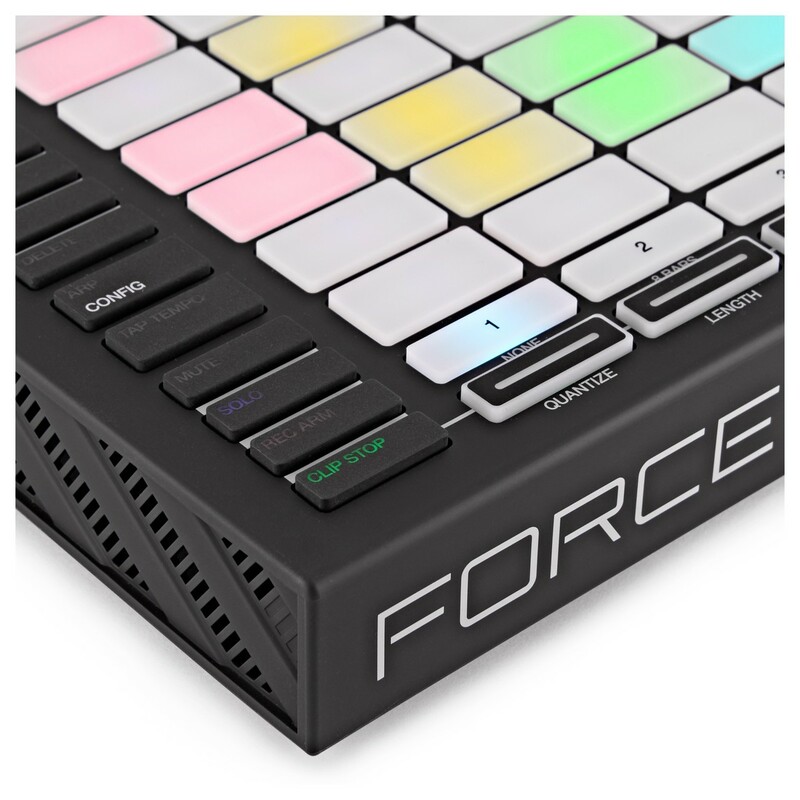 Featuring essential features such as clip-launching, step sequencing, sampling, synth engines, as well as a host of connectivity, the Force is an easy to integrate production tool. With an intuitive and expandable 8x8 matrix, trigger scenes, step sequence, all RGB backlit, you'll be lit up in any venue or back room. 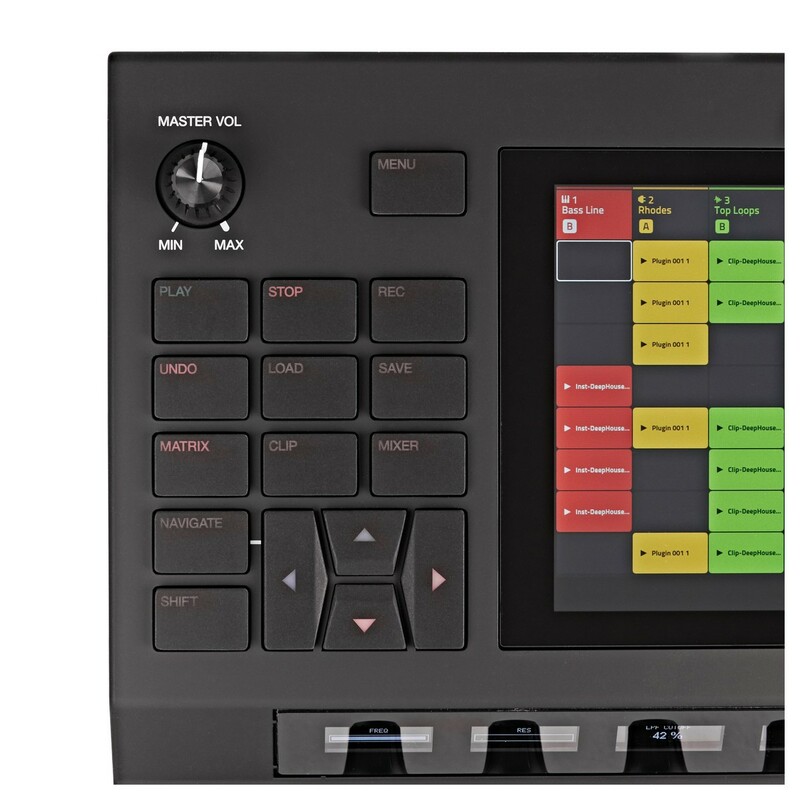 Browse through sound libraries, manipulate samples, synths and more all at the end of your finger tips by using the Force's 7-inch, full colour, multi-touch display screen. Find out why this is an essential for any producer or DJ. The Akai Force is designed to break boundaries between studio production and live performance. With 16GB of on board storage, you can import your stems, loops and one-shots into the Force and begin assigning them to the 8x8 clip matrix. You can then apply playback modes to loop, trigger, and remix your tracks. You can also time-stretch in real time without latency or digital artefacts impacting your samples. If you don’t want to use your own samples, the Force comes with 10GB worth of signature Akai samples. Use the extensive factory kit library to create your own drum tracks, as well as the highly regarded Synth engines that are present in the MPC 2.3 series update. Use these in collaboration with your own tracks and stems and assign these tracks to the Force’s crossfader for the ultimate mashup. You won’t need to worry about timing either, as the Force will automatically sync to a master BPM, so you’ll never miss a beat. Whether in the studio or on stage, there’s no reason you can’t excite your mixes and stems. Using the impressive new XYFX feature, you’re able to do this. 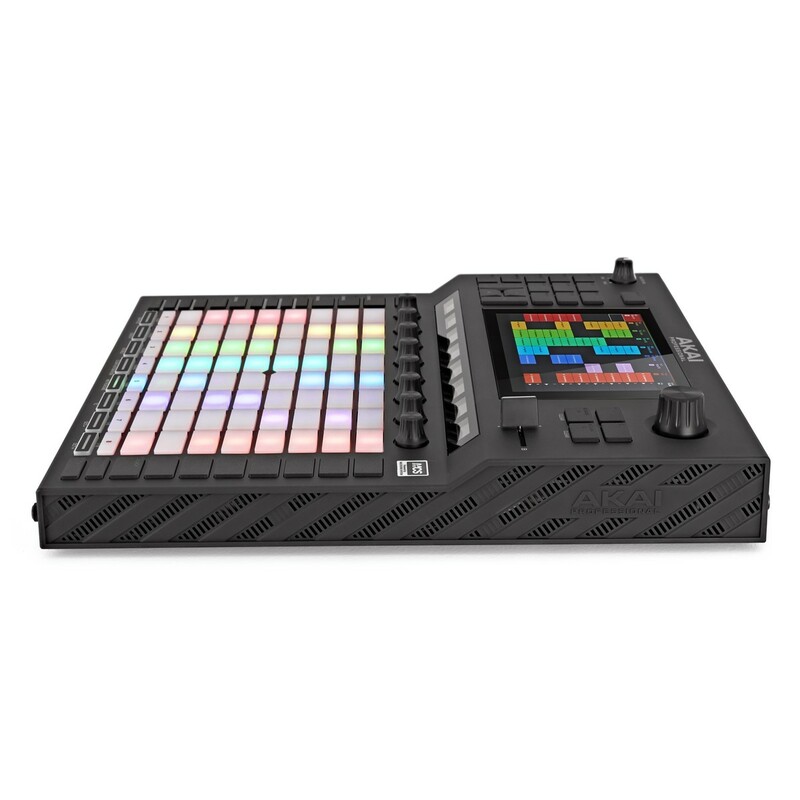 Use the Force’s 7 inch multi-touch display and on-board XFYX controls to apply filters, modulations, beat repeat effects, plus a host of additional features in individual tracks or selected outputs on the go. Take on venues with confidence. 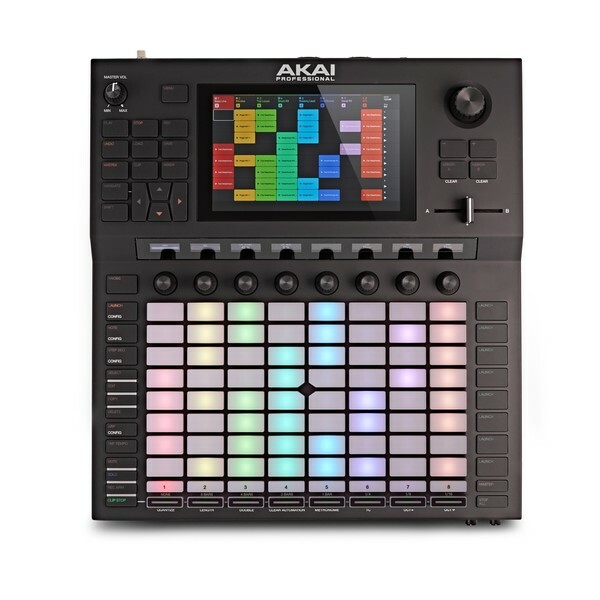 The Akai Force was designed with live performance in mind, either standalone as a performance centre, or, easily integrated into your current DJ set up. Link up to Ableton via a wireless network and sync your project with Ableton Link, which means it can also be linked with any of the existing Akai MPC series. In standalone mode, prepare with the Cue-Mix feature for the perfectly timed drop. 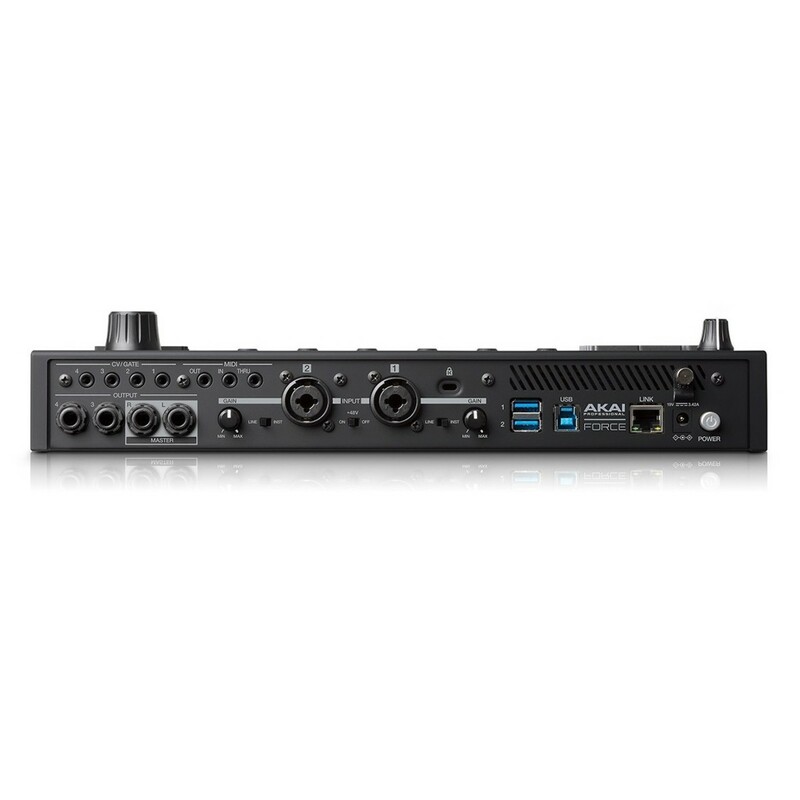 Dedicated cue assign controls and a cue mixer are available for outputs 3/4, as well as the cue-blend control on the headphone out on the front of the unit, so you have all the control. The Akai Force allows you to feel confident in your set. Unlike making changes using conventional laptop and DJ setups, everything can be commanded from the front of the Force. The 7 inch full-colour multi-touch capacitive screen allows you to search through all your various parameters and assign them to hardware controls. These can be assigned to any number of controls. 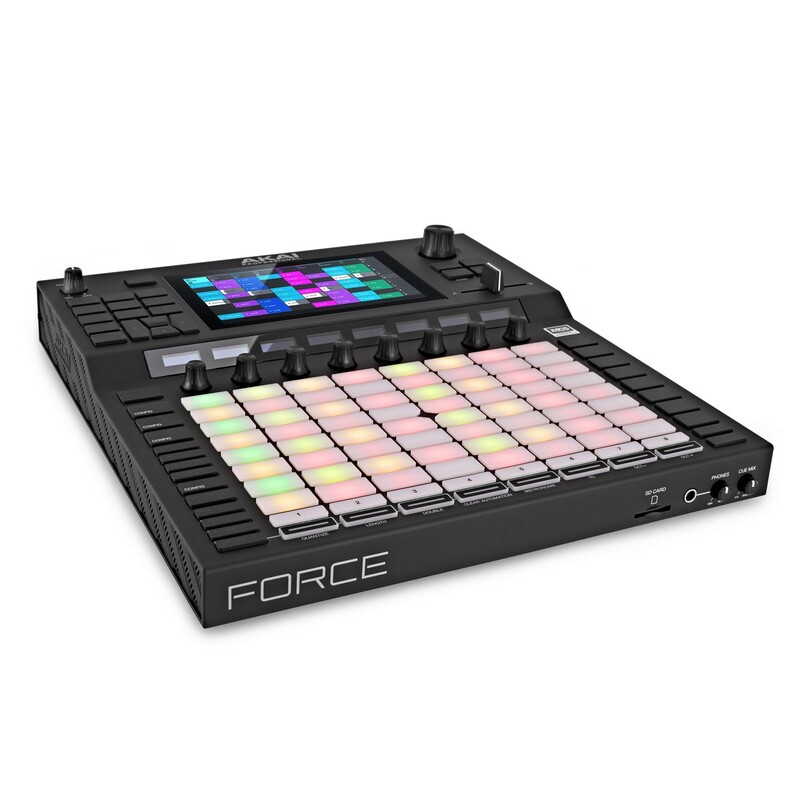 The Force features Akai’s class leading RGB drum pads (backlit so they’re ready for the stage or moody studio lighting), as well as eight 360-degree rotary encoders, all with OLED screens so you can see the value and what has been assigned to each touch capacitive encoder. These allow you to improvise on the go with total reassurance. With both producers and performers in mind, the Force is easy to use in any live or studio set-up. Much like the MPC range, the Force can be used as a sampler, just plug your synthesizer, drum machine, mixers, or instrument directly into the two Combi XLR/Jack inputs on the rear (with independent gain controls). Load the in-built Sampler and begin sampling and looping. Have total control of your outputs as well with a combination of four ¼-inch jack outputs on the rear of the mixer. Assign individual tracks to either the left or right main outputs of the Force and trigger samples to each out independently, whilst having your main beat playing in stereo for total, hectic stereo immersion. With the second set of outputs, you’re able to mix your own monitors, feed another mixer, or ever feed into another DJ system to have a scratch system on the go. You also have an independent headphone input on the front of the unit, so you can easily swap your headphone mixes between live sets. The Force is also filled with MIDI capability. With MIDI in/out/thru, you can send MIDI data to external synths, drum machines, or DJ controllers to trigger sounds during your set. You can also control sounds within the Force using the two USB’s on the rear panel by plugging in a bus powered MIDI controller. This will automatically route to your current session and allow you to play melodies and drum parts using a more traditional format instead of the pads. You can also link your modular gear. Much like the MPC X, the Force utilises 4 CV/Gate outputs to send MIDI data to external modules. You can also use the standard MIDI out to send data to any additional drum modules or synths. As well as the 16GB of on-board storage, there is also an SD card input on the front of the module. This will allow you to load your samples quickly, without the hassle of going to the back of the unit to plug in a USB. 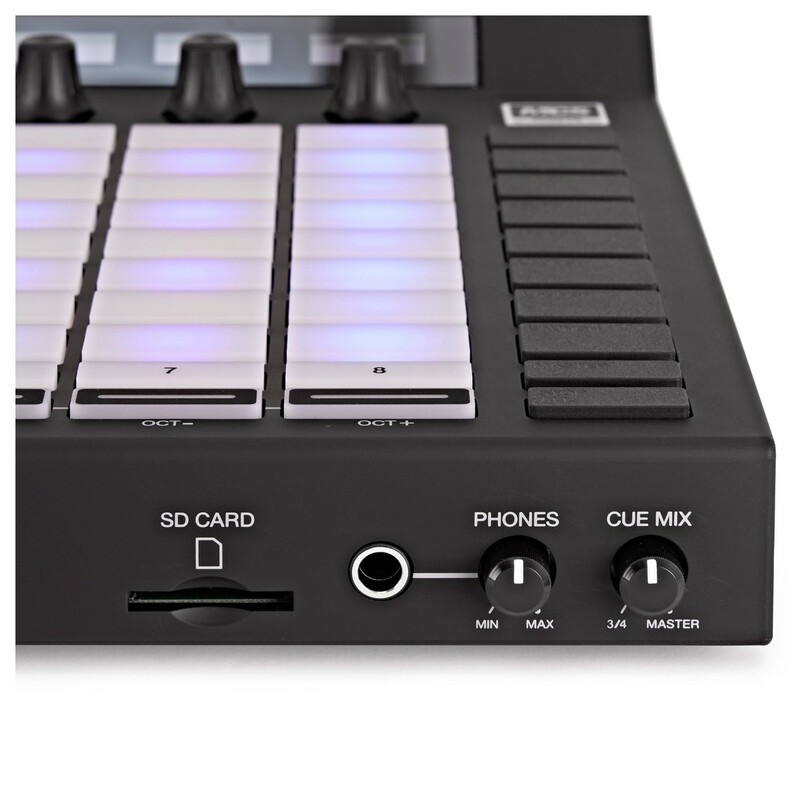 If you’d prefer to use a USB stick, the two USB ports can be used to load your beats, samples, and setlists. Ideal for a more permanent set up.